The arrival of triplets which is usually a thing of joy for some couple seems to be the reverse of the case for this couple who are struggling to make ends meet. Meeting him for the first time, you could think he is in his mid 40s. Eyes sunk deep into their sockets, jaw ruffled by beards and head fast losing the hair on it, there are many reasons to think in this manner. But despite these features, Sunday Asogba is only 35. A native of Badagry, a coastal community in Lagos, the responsibility of taking care of a wife and a daughter from his lean purse appears to have taken its toll on his young body. 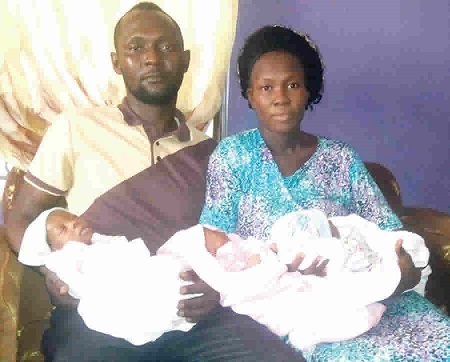 The arrival of a set of triplets – two boys and a girl – on June 10, 2018, has since compounded his misery. His shoulders and legs are already crumbling under the ‘heavy’ weight. “I cannot carry the burden alone,” Asogba said while pouring out his frustration during a recent encounter with our correspondent at the family home in Ifako, a densely-populated neighbourhood in the city. “I don’t earn much; the burden of taking care of my wife and first child was a big issue, let alone now that three more children have arrived. I need help, this is beyond my power,” he added solemnly as he trembled. A mobile phones repairer, the 35-year-old has not had life easy, contending with all sorts of challenges at every point along his journey. Long before he graduated from the Tai Solarin University of Education in 2010 where he studied Physics, Asogba had learnt that tasting success won’t come cheap. Learning the craft even before he gained admission into higher institution, the vocation helped support his education and welfare throughout his stay at TASUED. But dreams of a better life after those tortuous four years at the Ogun State-based university have not completely turned out as expected. Survival has become quite critical for the young man and his household. “I learnt phone repairs during a long strike while I was undergoing a diploma course at the Olabisi Onabanjo University, Ogun State, in 2004. I kept updating my knowledge on the job and when I got admission into TASUED, I was using the proceeds to support my education. “However, I didn’t want to continue fixing phones after I graduated, so I came to Lagos with the hope of getting a good paying job after my National Youth Service Corps programme. “But I stayed at home for a year searching for a job and going for several interviews without luck. In order not to remain idle, I took up a teaching job that paid around N12, 000 per month. I did that for three months before quitting. I had to fall back on repairing phones and from the little money I was able to save, I rented an apartment at the Mowe area of Ogun State where I began life,” he said. After meeting his wife, Olubunmi, while still in school and finally marrying her in December 2013, things had improved a bit but still far from where they would want it to be. “There was a time I didn’t have any money that I had to go and work as a labourer at a construction site where I was paid N1000 for all my effort. I felt like crying that day. Things got so tough that at a point, my wife had to sell her gold necklace for about N28, 000 for us to survive. It has not been easy. “When we had our first daughter who is four years old now, we agreed that we would not have another child until we were at least a bit stable financially. By the time she got pregnant, we were expecting a baby but to our greatest surprise, three of them came at once. “I was happy and jumping when I received the news of their arrival but within minutes, everything changed after reality dawned on me. “When the babies arrived, people gave me all sorts of advice with many of them urging me to run away. But because I have conscience and love my wife so much, I cannot think of doing such. “I really need the help of Nigerians in taking care of these children that God has given us. It is not just about money, I’ll prefer people help me with a job. I am a university graduate and I finished with good grades from Tai Solarin University of Education. If I’m offered a job, it will help me and my family better because if we are just assisted with money, in no time, it would finish. I am not saying we don’t want financial help, all I am saying is that a financial source would be better for us,” he said. Also appealing to kind-hearted individuals and organisations to come to their rescue, the frail-looking mother of the babies – Olubunmi – who is also a graduate of TASUED but yet to find a job several years after graduation as well, said that more than any sort of financial assistance, fixing them into jobs would go a long way in ameliorating their sufferings. “Taking care of me, our daughter and the three babies that just arrived has not been easy for my husband,” she said. “A lot of times I pity him and wish I had a good job with which to assist him. Though I worked briefly as a teacher in Ibadan, Oyo State, after completing my National Youth Service Corps Programme, since moving down to Lagos to be with my husband, it has been very difficult securing a job. “Much of what my husband manages to bring home at the end of the day goes into providing food for the family. We deny ourselves of a lot of things as a result of this situation but with more responsibilities added to our list, it has been very tough coping. If not for the fact that my husband is a God-fearing person, maybe he could have abandoned the children with me and run away. People gave him all sorts of crazy ideas but he did not listen to them. “We are appealing to Nigerians and indeed the entire world for help,” she added.